What happens when the different ways of speaking become automatized, and hatred turns faceless? In hate-speech, the object is bereaved of human characteristics, whereas the speaker himself often reveals his own face. How does hate-speech suddenly become normal? Racist strategies often involve shifts in the lighting conditions of whatever is at stake. It is as if the borders between light and shade are shifted without anyone noticing it. What earlier did not withstand daylight, becomes all the sudden a new normality, and in the shades new hate-speech keeps evolving – to become acceptable later on. The web and the new media created by it were originally made of anonymous discussions. Nowadays anonymity is no longer the issue, but people may insult one another in their own name. Everyday conflicts hide the seeds of larger tensions in society. When the trustration faced in daily surroundings is targeted at other people and groups, racism becomes structural. The photographic poem by Mannila and Kovalainen asks what kinds of effects are created by hate-speech, when it is shifted from one context to another. Who has the right to promote hate-speech, who has the power to flirt with racism? When we slip from justice to risking human rights, it becomes the task of the artists to make this transition visible and to resist it. Annina Mannila is a Tampere-based photographer focusing on photojournalism. With her background in the humanistic and social sciences, Mannila often enjoys a researching perspective in her photography projects. Mannila is interested in (photographing) people, all having their own realities, and in the backgrounds of different social, cultural and societal phenomena. 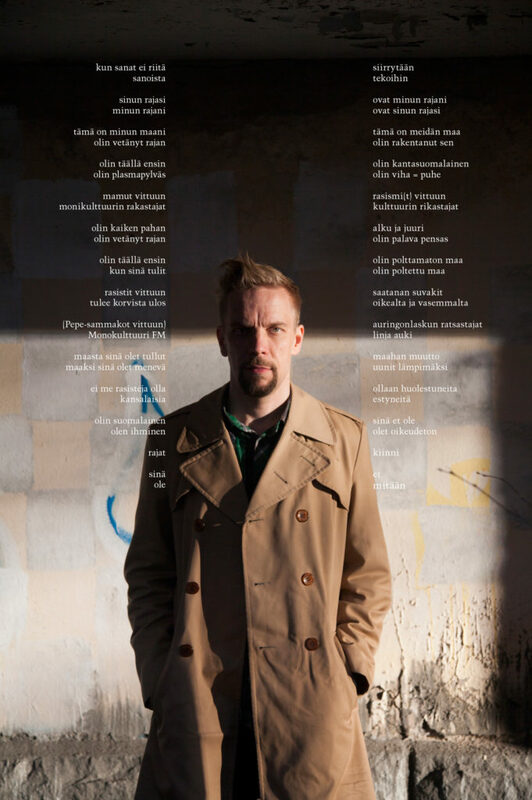 Aleksanteri Kovalainen is an author living in Tampere, born in Oulu and raised in Kuhmo. His debut novel Mädän elämän alkeet [Rudiments of the Rotten Life] was published in 2016. This was a twisted, psychological yet rebellious Bildungsroman, whereas in his second novel, currently in progress, Kovalainen deals with social and political issues. National Awakening (due to appear in September 2018) tells the story of the rise of neo-fascism in Finland – a social radicalization of sorts – to have taken place in the 2010s. The book is based on authentic texts and conversations in the social media, as well as acts of violence committed by the far-right and political decisions driven by rightist populism. Yösäilö (eng. Night Safe) gallery is vitrine gallery founded in 2016. The gallery is located at the entrance of Tampere Kunsthalle. Each exhibition is curated by one of the members of Tampere Kunsthalle. Works that consider the historical, political and economical context and the public space surrounding the gallery are emphasized in the curating process. Yösäilö gallery is free of charge for the artist.